For too long, the Dragon of Greed has hoarded a bright, shining treasure. 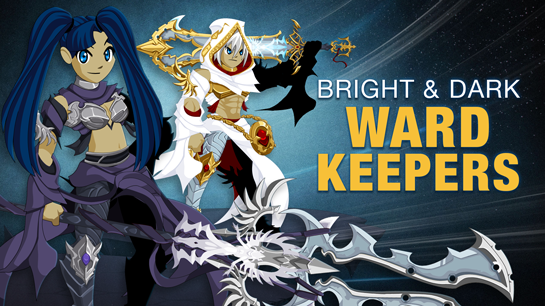 This weekend, fight to reach the Dragon's hoard, and then battle to steal the 0 AC Bright WardKeeper's set from his treasure pile! And if you like darker gear (or color-customizable items) find the Dark WardKeeper set in the Featured Gear shop until August 4th, available for AdventureCoins. 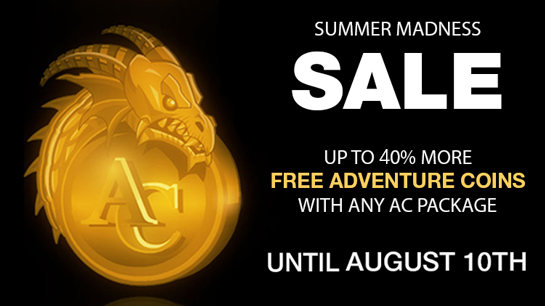 Get Up to 40% More AdventureCoins With Any AC Package! Through Thursday, August 10th, the Summer Madness AC Sale is ON! Get more AdventureCoins with each AC package, and the larger the AC package you buy, the more bonus ACs you'll have to spend as we continue our Summer of Dragons storyline: the Seven Deadly Dragons! So many of you emailed, Tweeted, Facebooked, and messaged us in-game thanking us for the bonus ACs last year that we wanted to keep that love and excitement flowing for the rest of the summer! * On August 10th, the bonus amount will drop, so if you're looking to buy AdventureCoins, this is the time to do it!